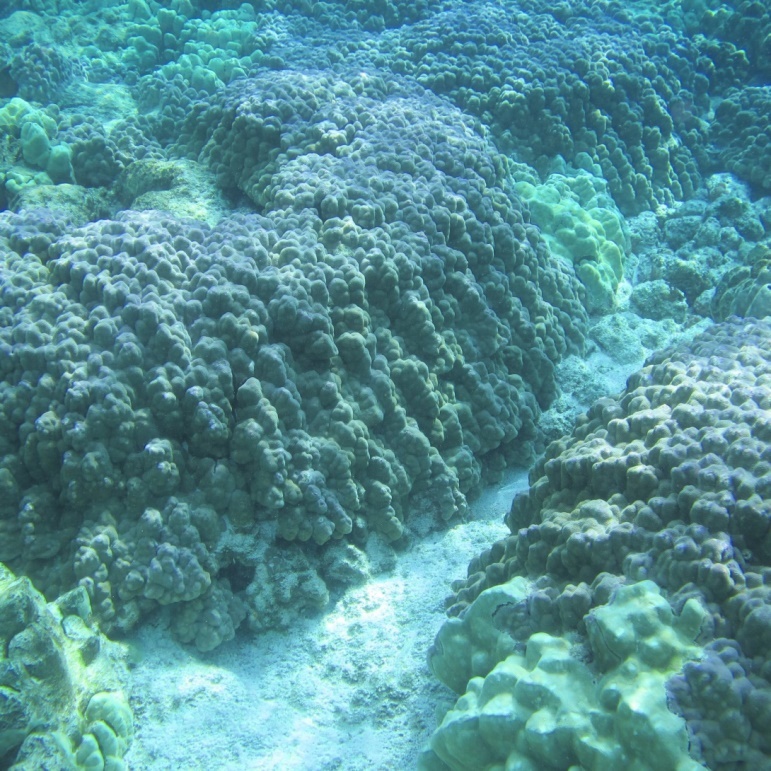 East Hawaii Coral Bleaching ‘Unprecedented.’ Hawaii Tribune-Herald, October 15, 2015. 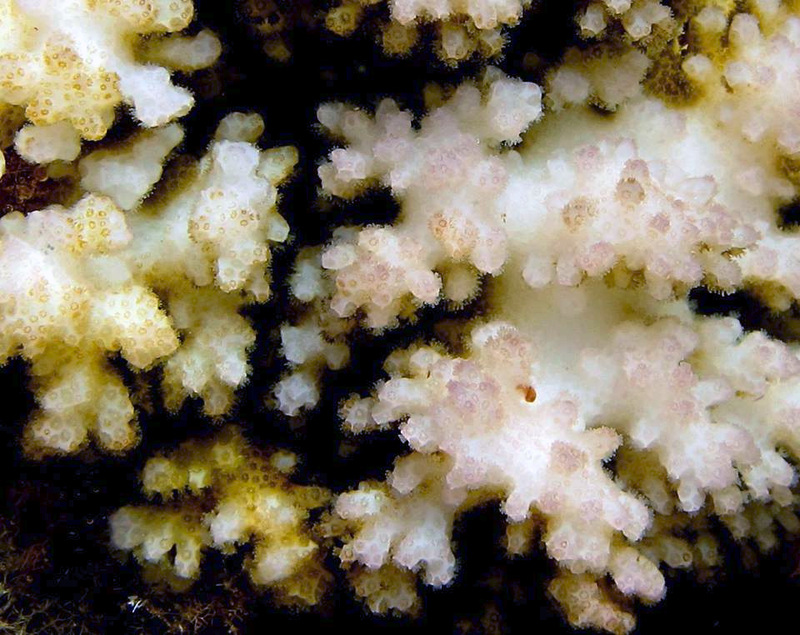 Bleaching Event Adds Ghostly Pallor to Hawaii’s Coral Reefs. Seattle Times, October 27, 2015. Can the World’s Coral Be Saved? LA Times, November 1, 2015. From Healthy to Dead: How Coral Bleaching is Devastating Our Oceans. Huffington Post, December 4, 2015. The original headline from the Hawaii Tribune-Herald (Hilo, Hawaii) newspaper was indeed ominous and as news services picked up the story, reports grew direr as weeks passed. And with most news, the story became old news and faded away. This report from Hawaii will examine the great bleaching event of 2015 from its beginning in the Fall of 2015 to the situation in late February 2016. It is not intended to be an exhaustive examination. 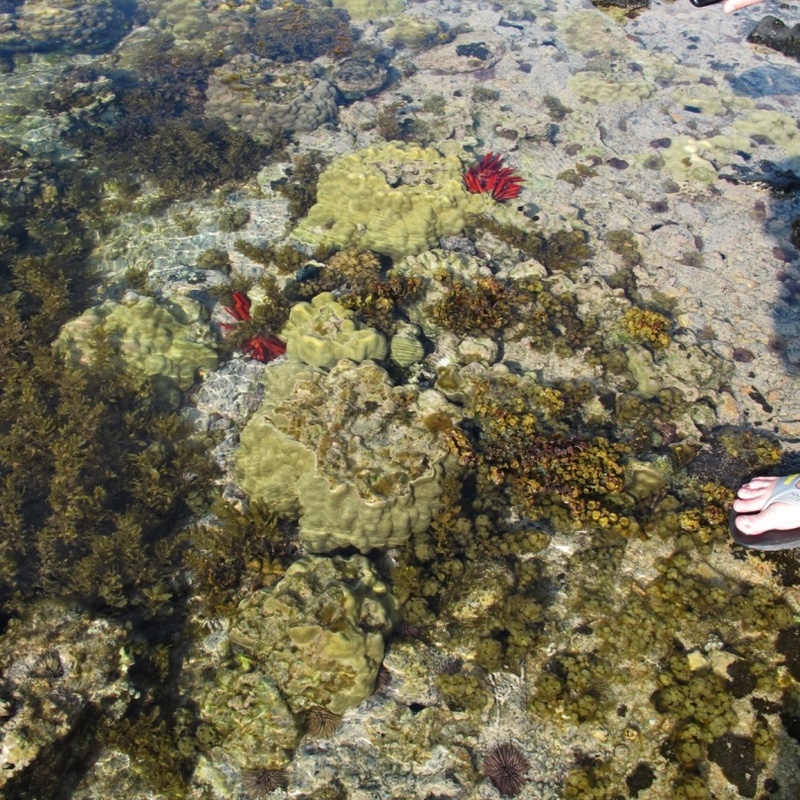 It simply presents my observations of corals on a reef flat at Kahalu’u State Beach Park in Kailua-Kona, Hawaii and in a tide pool north of the village. And it will report what news services have not. I recall with some humor (or horror, depending upon my mood) the definition of coral bleaching I was given when I moved to the Big Island in 1999. My ‘tutor’ assumed I knew nothing of corals when he explained that coral bleaching was caused by fish collectors using household bleach. Being that this fellow had just hired me, I merely nodded, bit my tongue and didn’t retort that bleaching is actually the expulsion of symbiotic algae living within corals’ tissues. And I would have further explained that once the golden-brown symbionts are no longer present in significant numbers, the white coral skeleton will reflect light making them appear ‘bleached’ white. Or that bleaching can be caused by warm water, cold water, high and low light intensity, spectral composition, ultraviolet radiation, insufficient nutrients, low salinity, and any other factor that causes extreme stress to the dinoflagellate or its coral host. Why Did Corals Bleach in 2015? Residents, or anyone unfortunate to visit Hawaii during late Summer/early Fall of 2015, endured hot muggy days, frequent thunderstorms, torrential rainfall and flash floods. This was the most miserable time of my 17 years here, and even lifelong residents had never experienced anything quite like it. This unpleasant episode is generally attributed to what is known as El Niño (or ENSO for El Niño Southern Oscillation.) El Niño (‘the child’) was so named by Spanish-speaking fisherman who noticed the periodic arrival of unusually warm weather around Christmas off the western coast of South America. It is now known that this climate pattern occurs irregularly every 2 to 7 years or so and triggers predictable global changes in temperature, winds, and rainfall. It is caused by dry, sinking air masses that alter trade wind patterns. When trade winds are weak, temperatures rise and vice versa. Sinking air masses in certain regions trigger an El Niño event. A La Niña (‘the girl’) event occurs as the locations of these sinking air masses shift drastically. It is incorrect to attribute ENSO patterns (and the 2015 bleaching event) to concentrations of atmospheric carbon dioxide since scientists examining fossilized coral skeletons (!) have found evidence that ENSOs have occurred for the last 125,000 years and perhaps longer. Many believe the 2015 coral bleaching event was triggered by El Niño and unusually high water temperatures (3-6°F higher than normal, or as high as 84°F – Chris Brenchley, National Weather Service, Honolulu) exacerbated by episodes of local lower salinity and muddy water due to flash flood runoffs. Figure 1. September 2015 air temperatures at Keauhou, Hawaii (Keauhou is about 1 mile south of Kahaluu.) Maximum temp of 95°F was seen September 25, 2015. Figure 2. Water temps reached a high of 84.2°F for 9 days during September 2015. I should note that some researchers think unusually high sea surface temperatures might not be entirely attributed to El Niño but instead its effects may be combined with those of something referred to as the ‘blob.’ The ‘blob’ is water temperature anomaly caused by long-lived areas of atmospheric high pressure which negatively affects wind patterns responsible for water mixing. Sea surface temperatures rise without this mixing. Predictions of an unusually intense El Niño event were prophetic, and scientists raised the red flag for a massive coral bleaching event in late summer. Sadly, this too would be proven true. I began watching corals in two of my favorite spots. I was particularly interested in observing stony corals of the genus Porites (commonly called Lobe corals.) These corals are known to contain a Symbiodinium clade referred to as ‘C15’ which is tolerant of high temperatures. I would use this coral as a ‘canary’ in order to judge the severity of bleaching. My initial thought was that this coral genus would go unscathed. And I would be wrong. Kahalu’u (or as locals call it, Kahalu) is one of my favorite Big Island snorkel spots. Besides being less than a mile from my house, it has ample parking and easy access/entry but best of all, it is full of colorful tropical fishes and corals. 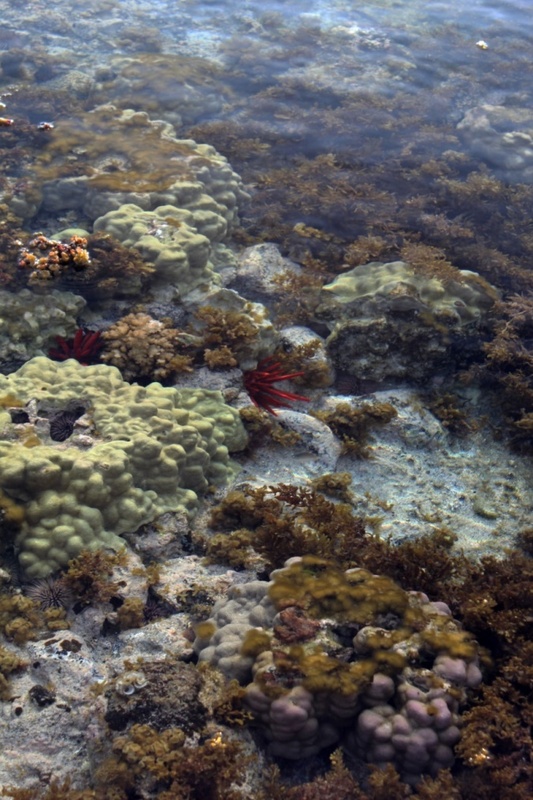 Unfortunately, many of these corals would not survive 2015’s bleaching event. As with most of Hawaii’s reefs, the corals of Kahalu’u consist mostly of two genera – Porites and Pocillopora. 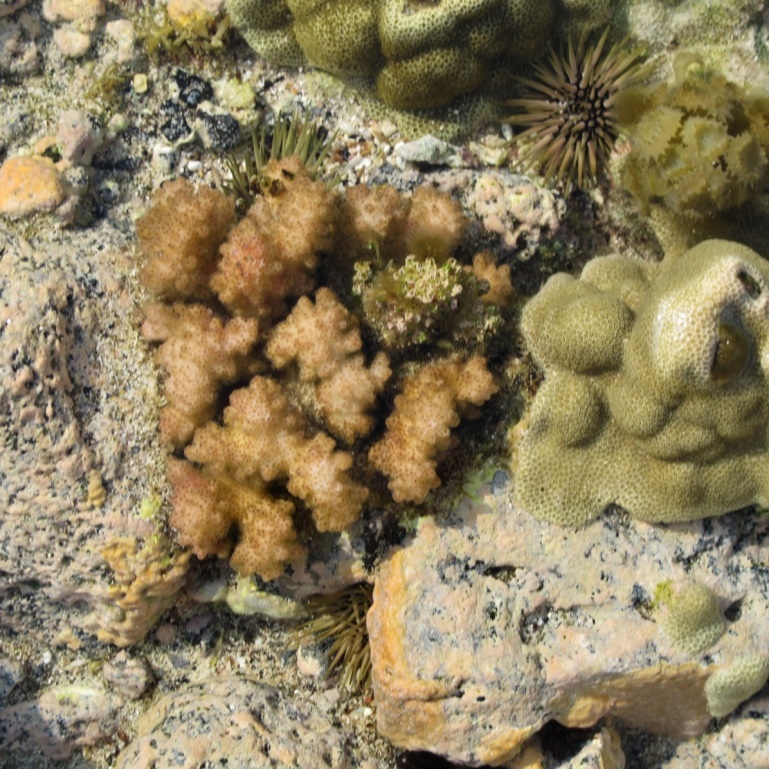 Of the genus Pocillopora, these two species are most common: P. meandrina (‘cauliflower’ or ‘rose’ coral) and P.eydouxi (‘antler’ coral), with the former being most abundant by far. Porites species are more difficult to ID as an exam of their corallites under a microscope is required, but I venture that the most common of this genus are P. lobata (‘lobe’ coral), P. lutea, or P. evermanni. Other genera seen include at least two Montipora species, Leptastrea, and a few others. The bad news. A 45-minute swim in March 2016 found the P. meandrina population to be devastated. I photographed every surviving specimen I could find. There were five or six out of hundreds of skeletons overgrown with algae. P. eydouxi fared even worse – I did not find one survivor. See Figure 3. Figure 3. A Moorish Idol (Zancluscornutus) swims among dead Cauliflower coral colonies (Pocilloporameandrina.) Photo by the author. Figure 5. …some retained living tissue. Figure 6. This one still lacks appreciable zooxanthellae population some 6 months after the bleaching occurred. 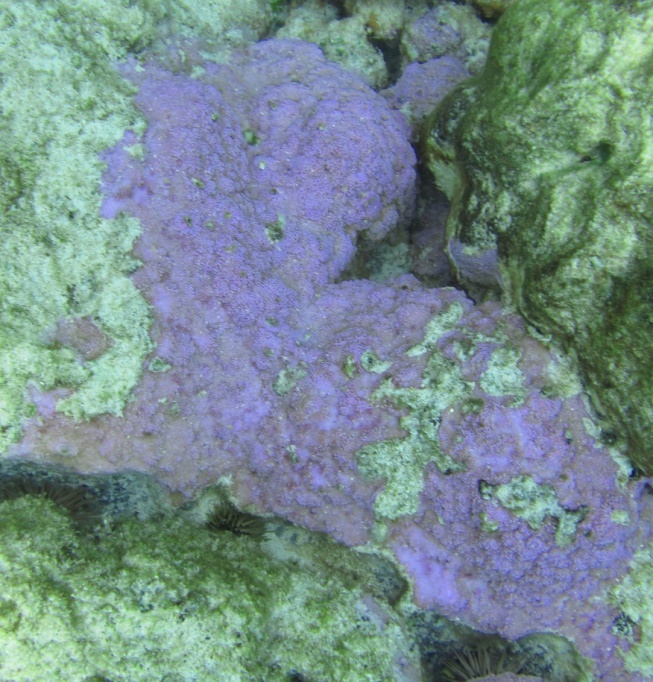 The purple spots are a response to gall crabs living within the coral’s skeleton. Photo by the author. Figure 7. A couple of Pocillopora specimens appear to have mostly recovered. Photo by the author. Porites corals fared much better. A very unscientific survey estimates the mortality rate at about 20%. Figure 8. ‘Old growth’ Porites colonies fared well at Kahalu’u. These are on the south side of the reef flat where there is much cool freshwater intrusion. Was this enough to keep these corals out of hot water? Photograph by Dana Riddle. Figure 9. 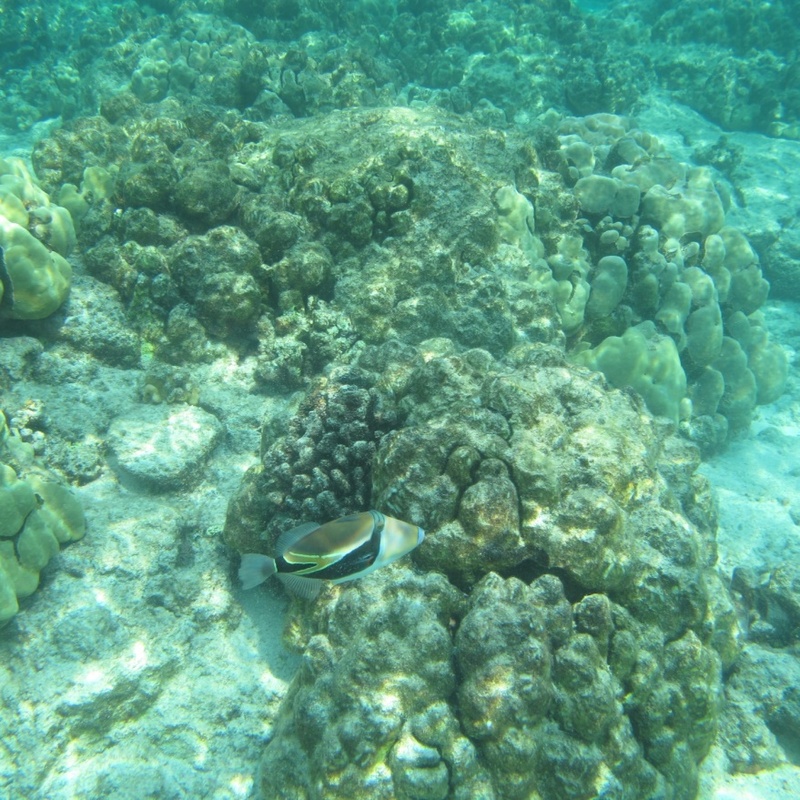 A humu triggerfish swims above a mix of live and dead Porites colonies. Photo by the author. If the survival rate of Porites corals is encouraging (relative to that of Pocillopora species) then the tenacity of the beautifully colored Montiporaflabellata (‘sandpaper’ coral) is good news indeed. See Figure 10. Figure 10. 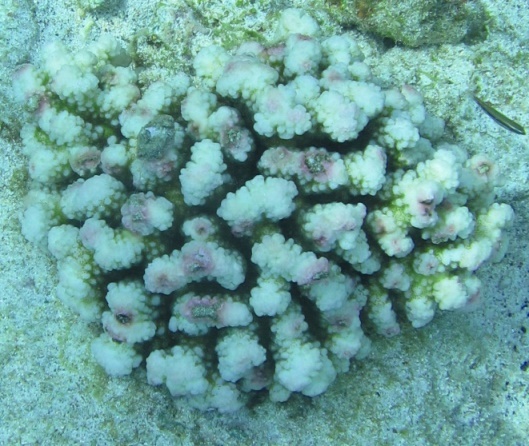 The encrusting coral Montiporaflabellata, endemic to Hawaii, had a very high survival rate in my estimation. I did not see one dead colony. Photo by the author. Montiporaflabellata, an endemic to Hawaii, contains a pink non-fluorescent chromoprotein. Attenuation of red light by the water column can make it appear purple or blue (but will appear pink if photographed with an underwater flash.) Researchers believe these colorful proteins can protect corals from bleaching and this certainly seems the case here. This tide pool is very shallow and is just a couple of feet at its deepest. But most of it is only inches deep. Despite this, it is full of many stony coral genera (Porites, Pocillopora, Leptastrea, etc.) and one soft coral genus (Sarcothelia.) 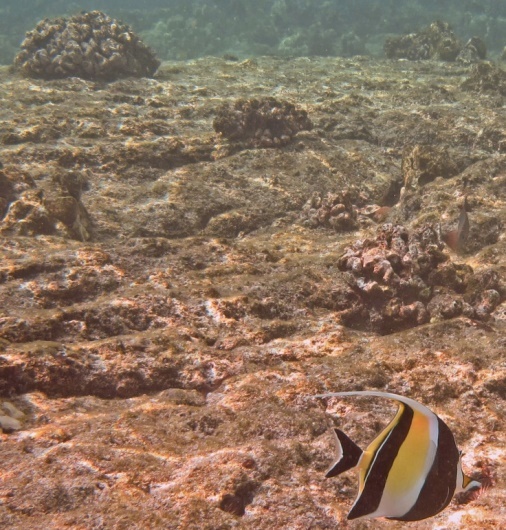 Many fish live in the deeper end as well – mostly Convict tangs (Acanthurustriostegus, or as Hawaiians call them, maninis), assorted damselfishes and several blenny species. Figure 11. Some corals bleached while others apparently did not. Hard hit were a Porites on the right, and a Pocillopora damicornis at bottom right. Due to this pool’s periodic isolation from the ocean, a high temperature of 86°F was recorded. Photo by the author. Figure 12. Some corals were only partially bleached, such as this Porites. Photo by the author. Figure 13. Close up of a partially bleached stony coral Pocillopora damicornis. Other ‘pdam’ colonies were totally bleached. Photo by the author. My original observations suggested coral mortality would be at least 40%. Some Porites corals were snow white, and almost all had filamentous algae growing on their surfaces. 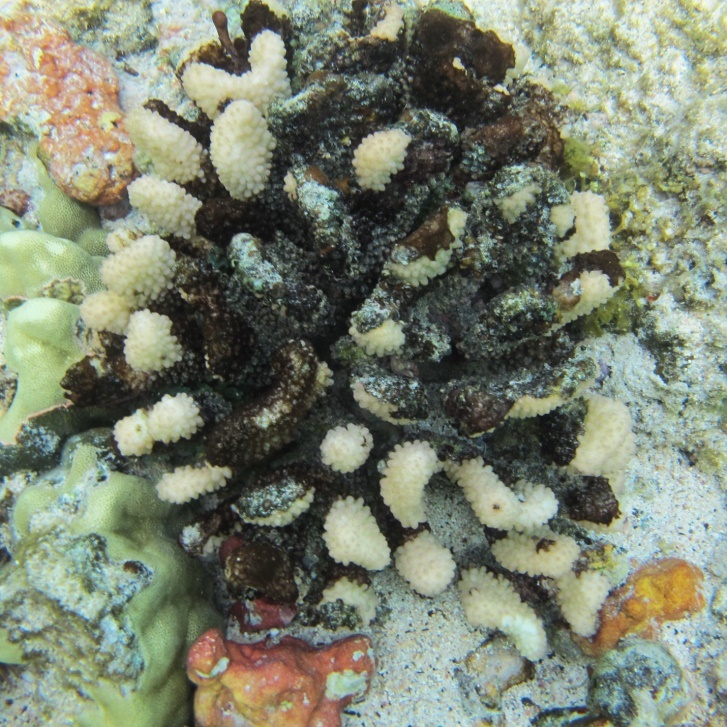 All Pocillopora damicornis had at least partially bleached. Would these perish as well? Only time would tell. Later visits proved my mortality estimates to be wrong. 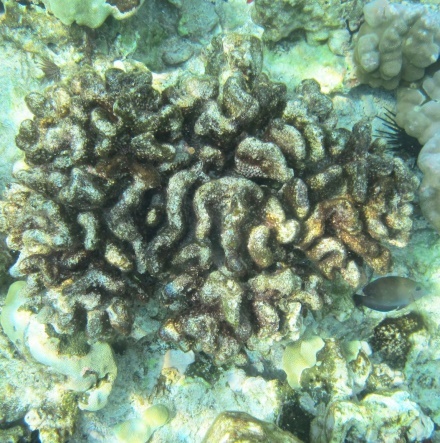 In fact, all corals but one were regaining their natural coloration indicating symbiotic zooxanthellae populations were returning to normal levels. Indeed, a meter specifically designed to test for chlorophyll content showed concentrations at a healthy 100 milligrams per square meter. I’ll discuss this instrument later in this article. 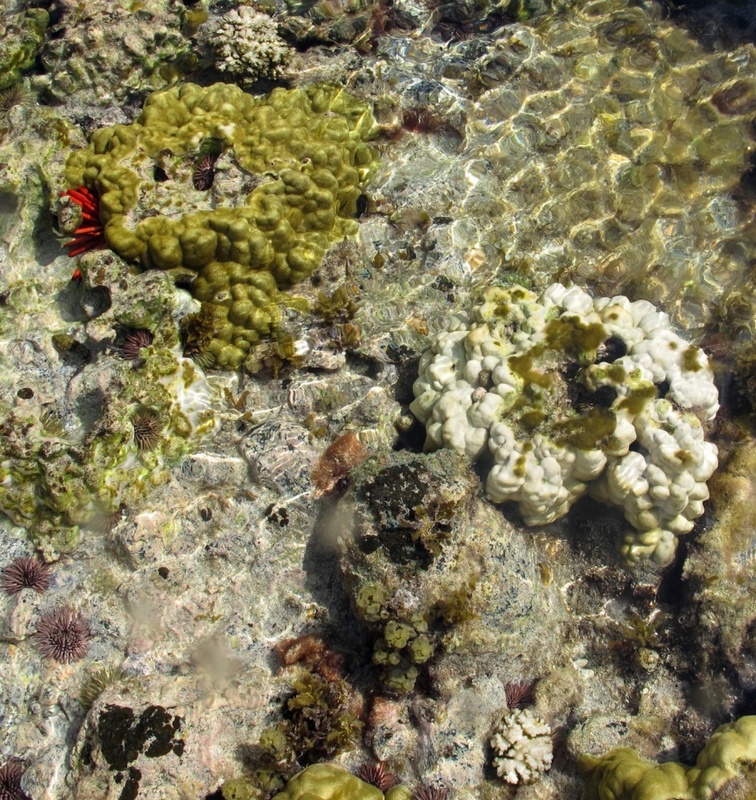 The following photos show the recovery of various corals within this tidepool. Figure 14. Compare this photo to Figure 11. The bleached Porites seen in that photograph is, in this image, at lower right and has fully recovered (using chlorophyll content as the metric.) Photo by the author. Figure 15. The seasonal seaweed Sargassumpolyphyllum (or limu kala) grows around this fully recovered green Porites coral. The red coloration on the coral is a reaction to an infestation of larval Podocotyloides stenometre trematodes. Photo by the author. Figure 16. This recovered Pocilloporameandrina has a hint of red coloration due to the presence of a non-fluorescent chromoprotein. Why did these tidepool P.meandrina colonies survive while those at Kahalu’u did not? Photo by the author. Figure 17. The tide pool corals as they appeared in late February 2016. Photo by the author. Figure 18. Red Pencil Urchins congregate around this Porites. Note that some of the coral is exposed to the air. Photo by the author. Again, I do not intend this short piece to be an exhaustive discussion of the 2015 bleaching event – it merely presents my limited observations. However, there are some important points that should be discussed. The corals in the tide pool live in a small shallow body of water of only a few thousand gallons, and it is often completely isolated from the ocean. Hence, these corals are subjected to intense amounts of photosynthetically active radiation (PAR, exceeding 2,000 µmol∙m²∙sec), ultraviolet radiation, salinity modulations, and perhaps most importantly, extreme temperatures. Combined, these factors represent a worst case scenario for corals and their symbiotic algae. It is little wonder these corals suffered. But it is very encouraging that the mortality rate was so low, and that zooxanthellae content (as judged by chlorophyll levels) has returned to normal levels. It is interesting to note that green Porites colonies seemed more resistant to bleaching than differently colored colonies (such as those that are gray and gray-brown. See Figure 14.) One rose colored Pocilloporameandrina seemed to suffer less than it brown counterparts. Both of these colors (green and pink) are non-fluorescent chromoproteins produced by the coral animal and are thought to lend a degree of protection against bleaching. The fact that some Porites corals initially appeared dead is easy to explain. The name Porites means ‘porous stone’ and it is quite possible that outer tissues died and internal tissues grew outwards to the surface and eventually became thousands of polyps. (I once used a WaterPik™ to remove Porites tissue and its zooxanthellae in a study of photopigments. I tossed the skeleton back into the aquarium and was amazed to see new growths of polyps a week or so later.) It is also possible that the stressed Porites covered themselves with a protective mucus tunic which became covered with algae and other fouling growths. As hobbyists know, these mucus coatings can cover these corals for days at a time before being shed. We should be encouraged by the resilience of some of these tide pool corals. They took a lickin’ and kept on tickin’. A recent journal article by Schoepf et al. (2015) described high survival rates of corals that lived in areas where water temperatures fluctuations were extreme (much as those seen in the Hawaiian tide pool described in this article.) In effect, the location of the coral can determine its resistance to stressors. 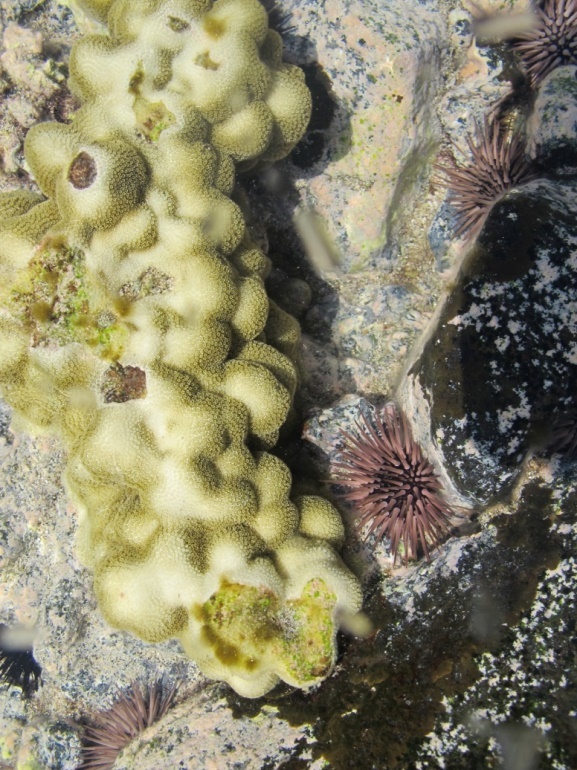 The recent description of the thermally-tolerant zooxanthella species Symbiodiniumthermophilumis welcome news indeed as this suggests some coral species can readily adapt to harsh conditions. On the other hand, it seems obvious that other corals not regularly subjected to high water temperatures have not adapted and will perish during elevated thermal events. Is this event a harbinger of things to come, where reefs are in a transitional state from those intolerant of warm water to those hardier corals? Though Darwin never phrased it exactly as ‘survival of the fittest’ the underlying message is the same – adapt or perish. Or is the theory of reticulate evolution more appropriate? Long term effects of the 2015 bleaching event are unknown, particularly its impact on the seasonal spawning events due to begin in April. 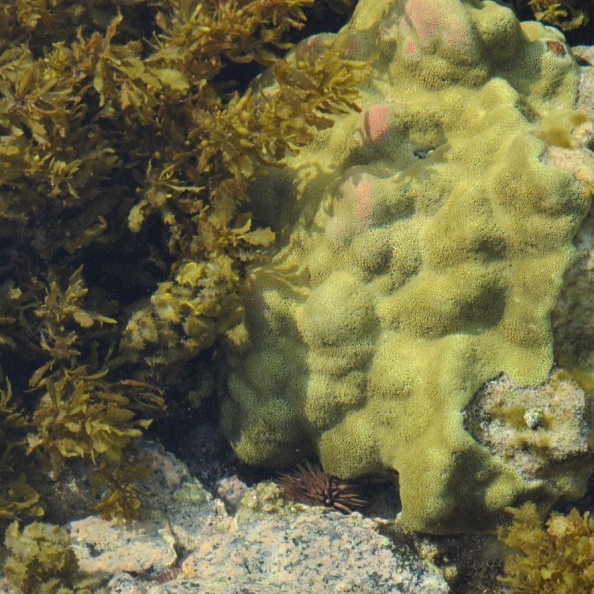 Could temporary loss of compounds supplied by zooxanthellae to the coral animal (such as amino and fatty acids) result in cases of malnutrition thus delaying or preventing reproductive efforts? I hope to have time to monitor Pocilloporameandrina and P. eydouxi in the coming months and relay my observations. In order to understand resistance to bleaching, we should examine the tolerance of zooxanthellae clades to temperature and other stressors. 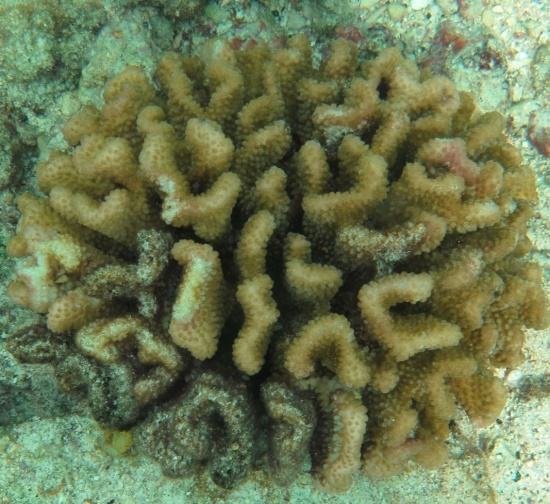 There are at least 22 zooxanthellae clades described as being present in Hawaiian corals. See Table 1. Pocillopora damicornis C34 Collected 59-82 feet, deeper water only? Pocillopora eydouxi C34 Collected 59-82 feet, deeper water only? Pocilloporameandrina C34 Collected 59-82 feet, deeper water only? Pocilloporamolokensis C34 Collected 59-82 feet, deeper water only? 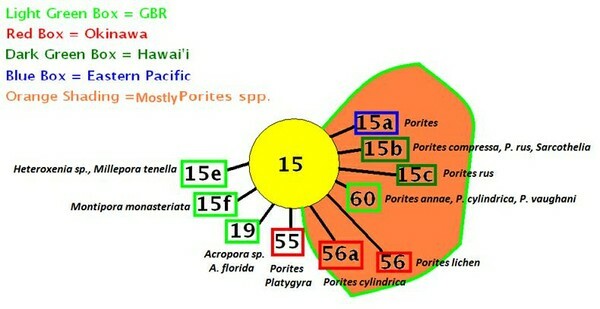 Only one ‘B’ clade has been described in Hawaiian corals. Figure 19 shows the relationships among various zooxanthellae ‘B’ clades. B1 is considered to be an opportunistic one and capable of thriving in post-bleaching environments. Suggett et al. (2008) found Symbiodinium clade B1 (less tolerant of high temperature than clade A1) produced more hydrogen peroxide than clade A1 (less sensitive to higher temperature) when exposed to a temperature of 32°C (89.6°F). H2O2 is destructive to tissues and excessive amounts play a part in the bleaching process. Figure 19. 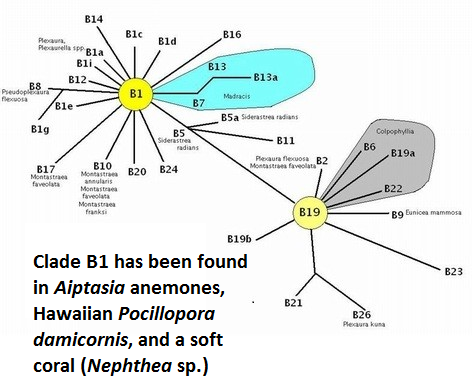 Clade B1 has been found in Hawaiian Aiptasia anemones and the stony coral Pocillopora damicornis. Figures 20, 21, and 22 show relationships of a few Clade ‘C’ zooxanthellae. Figure 20. 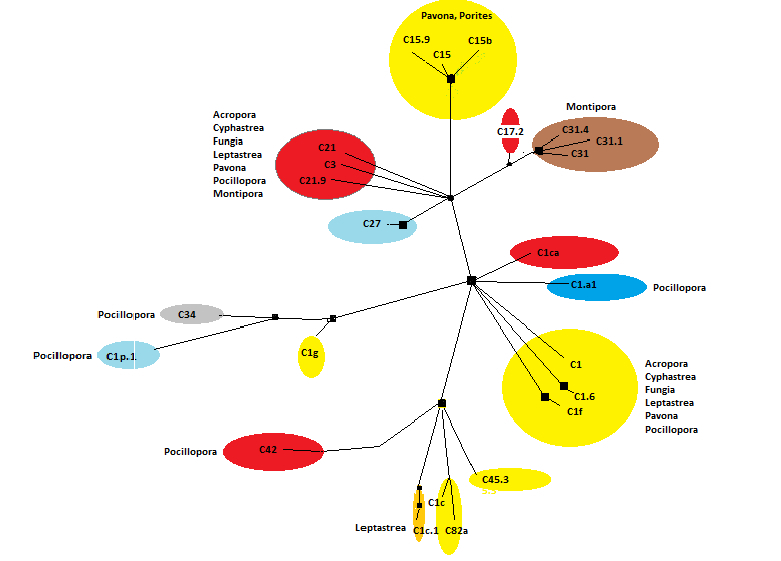 A phylogenetic tree showing relationships of a few zooxanthellae clades. Hawaiian Coral Hosts: Pocillopora damicornis, Pocillopora eydouxi, and Pocilloporameandrina. Comments: Clade C1c (along with C1, C3, C21, C3d, and C45) is believed to be an ancestral type from which other clades evolved (LaJeunesse, 2005). PAM fluorometry work found onset of photosaturation at 275 µmol photons·m²·sec (~5,500 lux) and onset of photoinhibition at ~425 µmol photons·m²·sec (~21,250 lux) in a shallow-water Hawaiian Pocilloporameandrina specimen (ITS 2 analysis by Smith et al., 2009; PAM fluorometry by Riddle, 2007: http://www.advancedaquarist.com/2007/3/aafeature1/ Ulstrap et al., 2006 report a Pocillopora damicornis specimen possibly containing C1c (or C1j, a subclade of C1) showing photoinactivation (a decrease in photosynthetic activity) at lower irradiance levels in shaded portions of the colony than in those parts exposed to direct light. This suggests these zooxanthellae have an ability to fine tune light absorption according to their exposure, or perhaps that these corals contain a yet unreported zooxanthellae clade that inhabits only shaded portions of the coral colony. 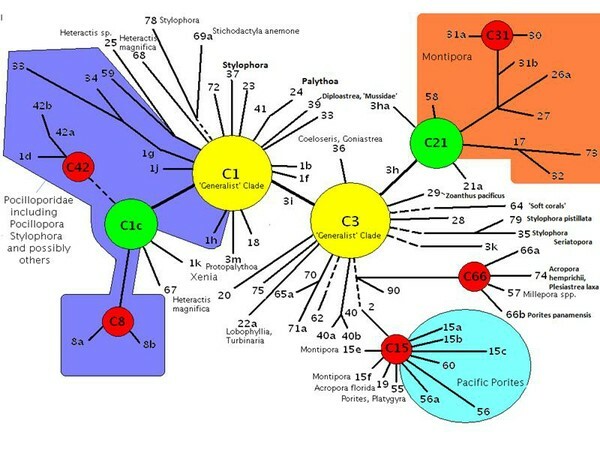 See Figure 21 for an idea of the relationship of C1c to other Hawaiian Symbiodinium clades. Figure 21. A phylogenetic tree showing information not presented in previous works. Comments: Found in Pacific Pocillopora spp. (there are no Pocillopora species in the Atlantic; LaJeunesse 2004.) C1d is a variant of C42 (which is thought to be a variant of Clade C1c, itself a variant of Clade C1, LaJeunesse, 2005). It is currently believed to be restricted in distribution compared to Clade C1c. Host Species: In Hawaii: Pocillopora damicornis. This clade is a pandemic generalist zooxanthella, reports seem to indicate this clade is remarkably adaptable over a bathymetric range of 0.3 – 90m (1-294 feet deep, and perhaps even deeper), and it is generally assumed to be adapted to deeper water environments. LaJeunesse, 2002 reports that C3 – along with C3a – were dominant in those corals situated deeper than 5m in waters of the Yucatan (Mexico). Clade C3 (along with C1, C21, C3d, C1c and C45) is believed to be an ancestral type from which other clades evolved (LaJeunesse, 2004). Those corals infected with Clade C3 include Acanthastrea and Acropora (1.0- 90m, LaJeunesse et. al., 2003), Acroporaabretinoides,Acroporaaculeus (GBR, Van Oppen, 2001), Acroporacuneata (Lord Howe Island, GBR; Wicks et al., 2010), Acropora digitifera, Acropora gemmifera, Acropora glauca, Acropora humilis (Taiwan, 3-5m, Chen, 2005), Acroporahyacinthus (two locations in Taiwan, ranging in depths of 3-10m, Chen, 2005), Acropora intermedia (two locations in Taiwan, ranging in depths of 3-10m, Chen, 2005), Acroporalatistella (8-10m, Taiwan, Chen, 2005), Acroporalatistella (Van Oppen, 2005), Acropora millepora (GBR, Van Oppen, 2001), Acroporamuricata (formosa) (1.0-5.0, Taiwan, Chen, 2005), Acroporapalifera (Taiwan, 0-3.0m, Chen, 2005), Acroporapulchra (Taiwan, 5-8m, Chen, 2005), Acropora tenuis (Chen, 2005; Taiwan, 5-8m), Acroporavalida (Chen, 2005, Taiwan, 5-8m), Acroporavalida (Van Oppen, 2001), Acroporayongei (Chen 2005, Taiwan, 3-5m), Acroporayongei (Solomon Islands), the Hawaiian anemone Boloceroidesmcmurrichi,Caulastrea, Cyphastrea, Cyphastreaserailia, Diploastrea, Discosoma sp. (Smith et al., 2009),Echinopora, Caribbean Erythropodia, Favia, Favites (LaJeunesse, 2003), Favitesabdita, Galaxeafascicularis (Taiwan, 3-5m, Chen, 2005), Goniastrea sp., Goniastreafavulus, Atlantic Gorgonia, Hydnophorapilosa, the Pacific soft coral Isis, Caribbean Isophyllastrea, Pacific Leptoria, Leptoseris (known to inhabit depths of 90m and more), Lobophyllia, Merulina, Atlantic and Pacific Montastraea (Warner et al., 2006), Montastreacurta, Atlantic and Hawaiian Palythoa spp. (LaJeunesse et al., 2003; LaJeunesse, 2004), Platygyra (LaJeunesse et al., 2003), Kenyan Porites cylindrica (Visram and Douglas, 2006), Porites heronensis, Seriatopora (LaJeunesse et al., 2003), Seriatoporahystrix, Siderastrea (Caribbean, LaJeunesse et al., 2003), Siderastreaintersepta (Belize, 8-25m, Warner, 2006), Siderastreasiderea (Belize, 2-25m, Warner, 2006), New Zealand Sinularia, Caribbean Stephanocoenia, Pacific Symphyllia, Turbinaria frondens (New Zealand; Wicks et al., 2010b), and Caribbean Viatrix (LaJeunesse et al., 2003). Hawaiian Coral Hosts: Porites brighami (at 20m in Hawaii, LaJeunesse et al., 2003); Poritescompressa (Hawaii, 15-25m, LaJeunesse et al., 2003), Porites cylindrica (GBR, LaJeunesse et al., 2003), Porites evermanni (now P. lutea, Hawaii, 5.0-20.0m, LaJeunesse, 2004), Porites lobata (Hawaii, 2-20m, LaJeunesse, 2003), Porites lutea (purple variant, 1.5m, Hawaii, Smith et al., 2009). As a footnote, a Hawaiian Porites compressa specimen was transplanted from depth to about 1m – it retained its C15 zooxanthellae. Figure 22. Relationship between Clade C15 and its subclades, along with host taxa. Comments: A variant of C15. Hosts: Hawaiian Montiporaflabellata. In other Pacific locales:Acroporalatistella, Archelia sp., Cyphastrea sp., Echinophyllia sp., Echinopora sp., Echinopora lamellosa, Favia sp., Favites sp., Fungia sp., Leptoseris explanata, Merulina sp., Montipora sp., Montipora faveolata, Montiporaflabellata, Montipora monasteriata, Pachyseris speciosa, and Pavona explanata. Note: The M. monasteriata examined was living in a cave, and was red-brown in color. High light brown and purple M. monasteriata specimens contain Clade C17 zooxanthellae (considered to be a generalist zooxanthella). Also found in many aquarium corals: Acropora sp., Acropora sp. (aquamarine blue), Acropora sp. (green morph), Acropora granulosa (purple/green; found in conjunction with Clade C94a), Acropora microphthalma, Acropora millepora, Acropora tenuis, Montipora capricornis, and Pachyserisgemmae. 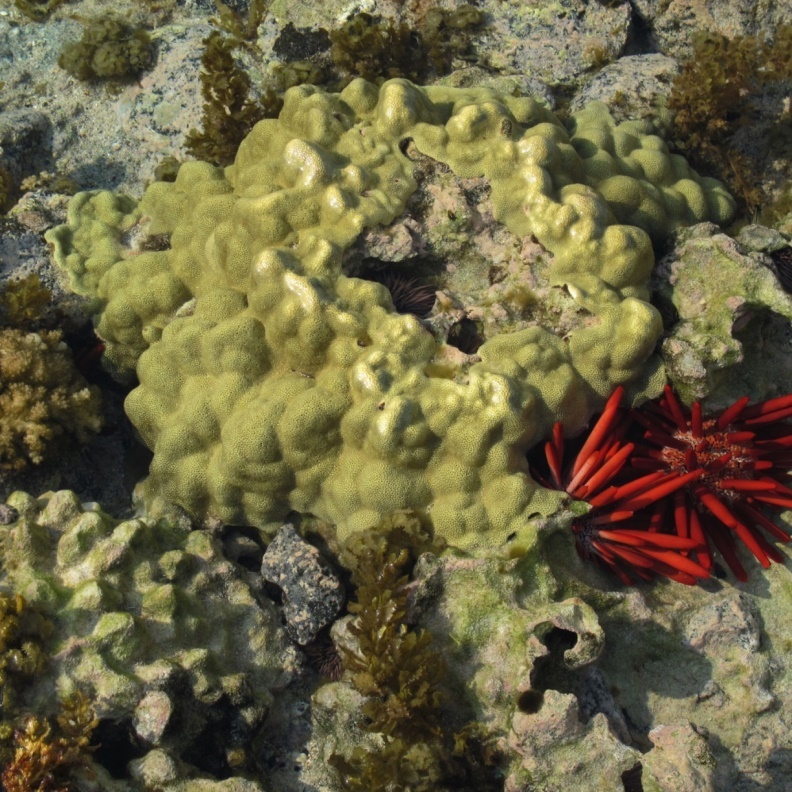 Hosts: Corals Cyphastrea, Echinophyllia, Favites, Galaxea, Hydnophora, Lobophyllia, Lobophylliacorymbosa, Hawaii’s Montiporaflabellata, Pectinia, Symphyllia (all LaJeunesse, et al., 2003), and the stony coral Turbinaria (LaJeunesse, 2004) have been found to contain C21a. Predominantly, if not exclusively, found in the northern hemisphere, and often in waters around Okinawa, Japan. Evidence presented here combined with other reports suggest this clade is tolerant of warmer and cooler waters. Host Species: Montastreaannularis, Montipora sp., Montipora capitata, Montipora danae, Montipora patula, Montipora turtlensis, Montipora venosa, Montipora verrucosa, and deep-water Stichopathessp.. It is possible this clade becomes parasitic when in low light conditions. M. flabellata can also contain clades C21a and C32, although it is unclear if these occur concurrently. Comments: Pocilloporamolokensis is thought to be restricted to deeper waters, suggesting Clade 34 prefers less light, UVR, or lower temperatures. Hosts: In Hawaii – Montipora sp., In other areas of the Pacific: Acroporamillepora, Agaricia humilis, Diploria labyrinthiformis, Montastrea franksi, Montastrea faveolata, Pocillopora elegans, Seriatopora hystrix, Siderastrea sidereal Stephanocoenia michellini, and Stephanocoeniaintersepta. Phylotype “D” are relatively resistant (generally) to bleaching (in comparison to many Clade C phylotypes), and, in fact, often found in areas that have suffered recent, severe bleaching episodes and hot environments. Clade G (G3.1) has been described as being found in Hawaiian Porites corals but it is possible that their presence is due to boring sponges (Stat et al., 2013.) However, Clade G has recently been found in soft corals (van Oppen, 2005a) and ‘giant’ sea anemones (LaJeunesse, in Pochon, 2005). Hosts: ‘Giant’ sea anemones; Junceellafragilis, Euplexaura nuttingi, Stereonephthya sp. #1, Hawaiian Porites. Note: Stereonephthya sp. 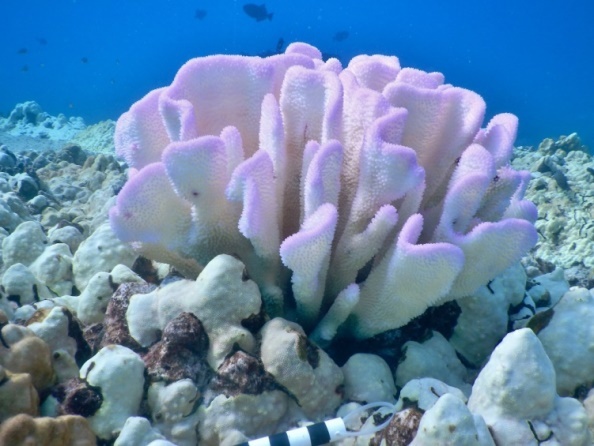 are generally considered to be azooxanthellate (that is, free of infection by Symbiodinium), however multiple sources list soft coral to contain zooxanthellae (if only rarely). Van Oppen et al., 2005a report the infected Stereonephthya to be bland in appearance and lacking the normal bright coloration. Clade G6 is reportedly found in Porites species (P. lichen, P. lobata, and an unidentified Porites specimen.) These corals were collected from the Northwestern Hawaiian Islands. It is interesting that Clade G is reported from high latitude reefs, suggesting that this clade prefers cooler waters. Chlorophyll is the major photopigment found within corals’ zooxanthellae hence knowing its concentration gives us an idea of the health/population size of captive Symbiodinium dinoflagellates. Chlorophyll content can be estimated by at least two methods. The first is done by sacrificing by the coral and extracting the chlorophyll with a solvent. This solution can then be tested through spectroscopy. A second and much more desirable method is non-invasive and involves examination of ratios of chlorophyll fluorescence to determine the amount of chlorophyll. A few years ago, I purchased a CCM-300 chlorophyll content meter manufactured by Opti-Sciences, Inc. of Hudson, New Hampshire, USA. This small hand-held device uses blue light (peaking at 460nm) to excite chlorophyll fluorescence. The ratio of chlorophyll fluorescence emissions (at 698-708nm and 730-740nm) is linear to chlorophyll content at content of ~40 milligrams/square meter to ~675 mg/m². Fiber optic cables allow measurements of chlorophyll content of aquatic organisms in shallow water. See Figure 24. Figure 23. 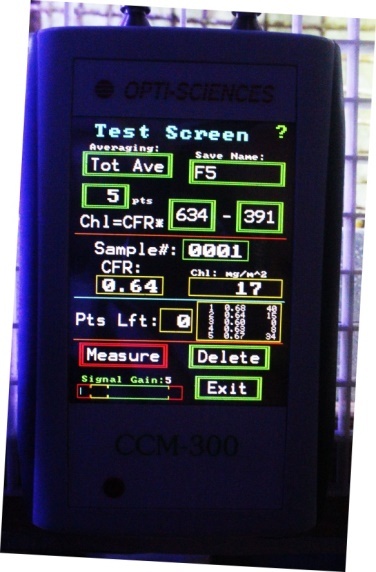 Opti-Sciences’ CCM-300 chlorophyll meter. It can reliably measure chlorophyll content down to ~40 milligrams per square meter. Fiber optic cables allow measurements of corals in shallow water. For those interested, this instrument currently sells for $2,695 US. Figure 24. 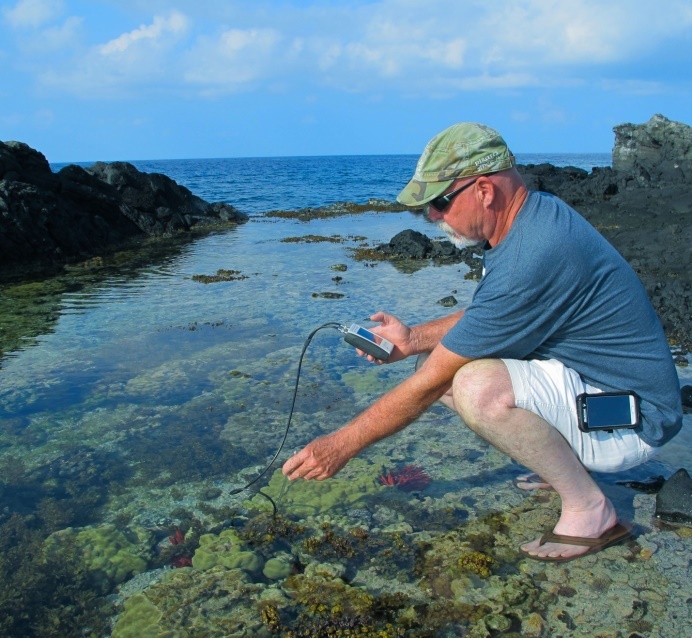 The author checks chlorophyll content of zooxanthellae within tide pool corals. Photo by ‘Big Mike’ Frame. Schoepf, V., M. Stat, J. Falter, and T. McCulloch, 2015. Limits to the thermal tolerances of corals adapted to a highly fluctuating, naturally extreme temperature environment. Scientific Reports 5, article 17639.